India's history goes back at least five thousand years making it oldest culture in the world. Its chequered fortune are reflected in the infinite verities of its monuments - Forts, Palaces and Temples. In this tour we will take you some of the classical and best-known sites of India including The Capital City -Delhi where every crumbling wall has a story to tell. The city has lived through wars and resurrection, repeatedly rising from the ashes. 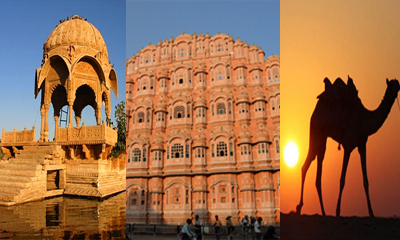 The city of Royal Splendor -Jaipur with its magnificent fort - Amber Fort and Hawa Mahal - The landmark of this beautiful Pink city. Agra -City of love and home to one of the seven wonders of the world-the Taj Mahal. The temples of Khajuraho, where Life, in every form and mood, has been capured in stone. Varanasi - Oldest city in the world, the city of Nirvana and Ghats where people still are having their daily prayers and rituals and Temples and centuries old culture. The mix of all these attractions makes a perfect blend of Classical Journey". Accommodation on Twin share for 09 nights / 10 days on Bed + Breakfast basis. All transfers, sightseeing as per the itinerary above. Train Fare for the sector Agra to Jhansi by Bhopal Shatbadi by Chair car. All applicable hotel taxes . ( incase it will increased by the government then it will be charged extra). Any Airfares for the sector Khajuraho / Varanasi / Delhi. Upon arrival transfer to hotel.Overnight at Hotel. Am visit full day sightseeing of Delhi and visit Red fort, Qutab Minar, Humayun's Tomb, India Gate, Raj Ghat, President House. Overnight at hotel. Morning proceed to Jaipur by road, on arrival check-in at the hotel. Afternoon visit the City Palace, a blend of Mughal and Rajasthani architecture is now a museum, containing all the paraphernalia of Jaipur's princely past. Jai Singh, notable astronomer, built for himself the curious Jantar Mantar, an observatory of immense brick and mortar instruments of astonishing accuracy. Not far from Jantar Mantar, is the beautiful Hawa Mahal (palace of winds), tall and pink, faced with delicate pierced stone, it is not really a palace .The queens of Jaipur and the royal ladies once used this decorative facade to watch, unobserved, numerous festive processions winding through the streets of their city. In the morning half day sightseeing of Amber Fort and enjoy an elephant ride on the ramparts of the fort, for six centuries the capital of the state. Afternoon free for leisure / independent activities on your own . Overnight stay at hotel. After breakfast drive to Agra, en-route visiting Fatehpur Sikri - a fascinating Ghost town, lies a little before Agra. Emperor Akbar, wearying of Agra built a new capital here, only to abandon it a few years later for lack of water. And there it remains, its fortifications, massive gateway and palaces, in a wonderful state of preservation. Set like a jewel in a courtyard of pink sandstone is the marble tomb of the Saint Salim Chishti, enclosed by delicately carved marble screens. Arrive Agra and check-in at hotel, later in the day visit Taj Mahal - built by a grief-stricken emperor, Shah Jahan, as a memorial of his beloved wife Mumtaz Mahal, retains its pristine beauty. Agra Fort - perhaps the most moving view of the Taj Mahal is from a little octagonal tower in the Agra Fort across the River Jamuna. Overnight stay. After breakfast transfer to railway station to board train for Jhansi . Upon arrival check drive to Khajuraho . Khajuraho, assistance on arrival and transfer to the hotel. Pm free time on your own . Overnight stay at the hotel. Am free. Later transfer to Khajuraho airport for flight to Varanasi, assistance on arrival and transfer to hotel . Pm free at leisure on your own. Overnight stay. The oldest city in the world, the city of Nirvana and Ghats where people still have their daily prayers and rituals and Temples and centuries old culture. Rarely does any place influence the life of a religious community in such totality as Varanasi, an ultimate pilgrimage, a city dedicated to the Gods. This eternal city is one of the most important pilgrimage cities of the world. Situated on the banks of the river Ganges this city has been the centre of learning for more than 2,000 years. 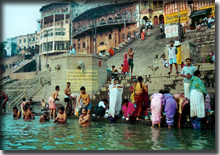 The ancient names of Varanasi are Kashi and Banaras as described in the Hindu mythology. The present name is derived from two rivers Asi and Varuna. Later city tour of Varanasi, visit Vishwanath Temple. The gold plating on the shikharas was a gift of Maharaja Ranjit Singh in 1835. On account of this it is popularly known as Golden Temple. Bharat Mata Temple, a novel temple dedicated to Mother India, And drive through the Bazaar. Afternoon excursion to Sarnath, here in this peaceful Deer Park, the Lord Buddha preached his first sermon more than 2500 years ago. The site is marked by the massive Dhamek Stupa which is believed to date back to 500 AD. The remains of the great Ashoka Pillar still stand before the main shrine. Overnight stay at the hotel. Am free . Later transfer to Airport to connect with flight for Delhi .Upon arrival directly transfer to International Airport to connect with flight for onward destination.